Home Science Lab, Gifts for Geeks: Educational Innovations, Inc. 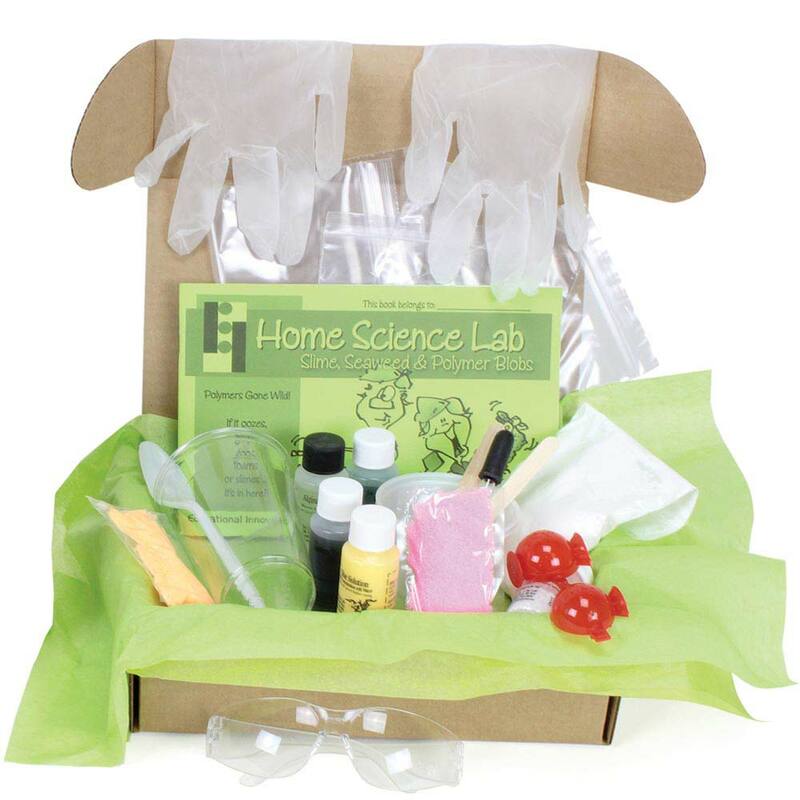 The Home Science Lab is a monthly subscription kit for children ages 6-11. Our Home Science Lab is a 1, 3, or 6-month subscription series bursting with unique hands-on materials for children ages 6-11. There is simply no substitute for the kind of sensory learning your young scientists will experience in each month's box. And besides, what's more fun than sitting around your kitchen table doing science with your kids?! They'll be having so much fun with these unique hands-on projects, they might not even realize that they're learning! Check out our VIDEO tab (above) for preview videos on these kits. Your first kit comes with a free pair of safety glasses (a $2.95 value). For more information about our Home Science Lab and about extending your subscription, click here. Read more on our Blog - Tabletop Fossil Safari - Science Camp in a Box! Read more on our Blog - Introducing the Home Science Lab! My almost 5yo loved this! I read the instruction booklet to her and she was able to do most of the experiments herself. She loved them so much she wanted to do them over and over again. I appreciated that the booklet is written for kids but isn't gimicky: it gives the real scientific explanations. Wonderful! Great Home kits for little scientists. Ordered 2 six month labs for my nephews. They have thus received month 1 and love the activities. Hoping lab kits 2-6 are just as enjoyable and educational. I'm give it 4 stars in lieu of 5 as I have only had one kit to review. Gave a six month subscription to my nieces and they LOVE IT. There first one was slime. I also gave one to my granddaughter. Her first one was minerals. She loved the different rocks and that they included a rubber glove that actually fit her hand! I would definitely recommend this for gifts. I received the first box - Slime, Seaweed and Polymer Blobs - as a gift for my 6 year old twins who LOVE science. The experiments are perfect for little scientists with supervision from a parent, and yet are engaging enough for kids of pretty much any age who are interested in science. My kids got a kick out of the cartoons in the booklet and the descriptions of the process. We spent some time reviewing WHAT was actually happening in the experiment, and going over some safety basics (always wear goggles, never put anything in your mouth unless you know it's not poisonous, etc). The best part of this box (versus similar subscriptions, which we also have) is that the people who put it together thought about things like adding artificial color to make the slime look like boogers, adding commentary on different ways in which you can impress your friends, including fun facts, etc. Overall, super fun!!!! I purchased this subscription for my 8 year old granddaughter for her birthday. She has always enjoyed science, and this kit was perfect for her. After she completed the activities in the first kit, she just couldn't wait each month for the others to arrive! Thank you for creating such a well thought out and interesting kit for young kids who enjoy science! From the fun cartoons on the box to the experiment names such as "Big Cup O' Boogers" this science kit screams kid. There are so many experiments included in each box and all the experiments were easy for my 11 year old son to complete on his own. I love that the instructions include not just how to complete the experiment, but why it works and even sometimes how the science is applied in the real world. These kits would not only be a great addition to any classroom or home school program, but are just fun to play with! Both of my children (ages 5 and 7) love this product. They check the mail each day waiting for the next lab to arrive. When it does, they jump right into it (with a little help from mom and dad) together. It's fun, a great family activity, and educational, too. They both feel like scientists when they go through the activities and experiments. Thank you for creating such a great product and delivering it to our door each month!